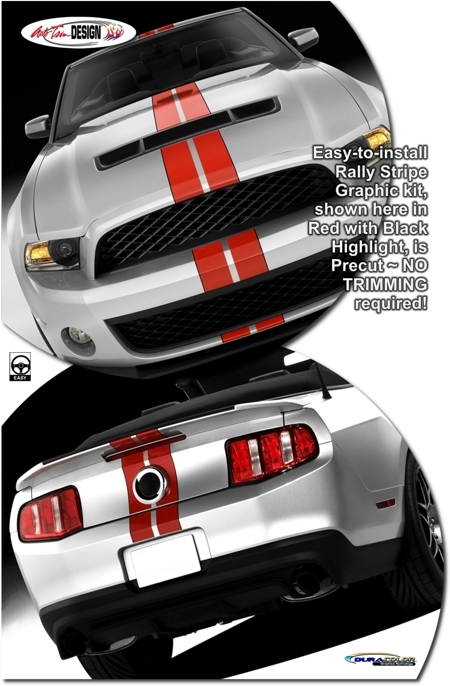 Run proud with this great-looking SVT Performance inspired two (2) color Rally Stripe Graphic Kit! Kit is PRECUT and ready to install in one of twenty-four (24) color combinations - NO TRIMMING required! Digitally printed with our DuraCOLOR graphic technology, kit is manufactured with premium automotive grade vinyl film materials. As a further step, graphic is covered with a 2.5 mil clear Gloss or Matte laminate which provides protection from miles of abuse. This stripe package is not just straight strips in a box. Our graphic kit consists of prefitted and contoured pieces as shown in the illustration. Kit is specifically made for '10-'14 Ford Mustang factory bumper, hood, roof and rear deck areas and will not fit any other vehicle. Trimmable two (2) piece Hood Scoop Kit (ATD-FRDMSTNGGRPH253) consists of two (2) 40" (101.60cm) long pieces that can be hand trimmed for most hood scoop applications. Trimmable two (2) piece Spoiler Kit (ATD-FRDMSTNGGRPH262) consists of two (2) 16" (40.64cm) long pieces that can be hand trimmed for most after-market spoiler applications. Price shown is based on a '10-'14 Ford Mustang Shelby GT500 Coupe. Build a kit to your specific vehicle using the drop-down selection boxes below. While Red is one of the colors offered in the Color Combination selection, we do not guarantee and exact color match to the Red color that comes on the factory installed SVT Performance Package.